If you are not completely satisfied with RHP products for any reason, simply return the unused portion any time within 60 days after purchase. You'll receive a full refund. No questions asked! Shipping costs are not refundable. Return shipping costs are paid by the customer. We will not give pro-rated refunds for cancellations made after the 60-day trial period. No more than a 2 month supply will be refunded unless full and unopened bottles have been returned. Some offers provide certificate codes which may be entered in the appropriate space while viewing your shopping cart or given in mail or phone orders. All certificate redemption codes will be sent via email upon completion of initial order and payment in US Dollars. If you do not know your redemption code, you may call Customer Service for assistance at 1-866-482-6678 or 1-561-750-1418. All certificates are redeemable toward future purchase of any product/s at www.RenownHealthProducts.com. Only one certificate may be used per order. May not be combined with any other offers or discounts. I understand I should not use this information to diagnose or treat any health problems or illnesses without consulting my doctor. I also understand that RHP products are not intended to be used to treat any type of medical condition. 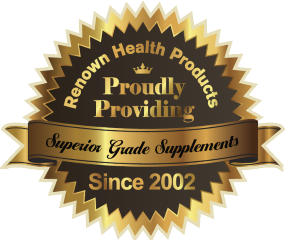 You may contact our Customer Care department via postal mail, by using our online support system, or by using our toll free phone number: 1-866-482-6678 (or regular phone number 1-561-750-1418), or by emailing us at questions@renownhealthproducts.com. BY USING THIS WEBSITE, YOU ASSUME ALL RESPONSIBILITY AND RISK FOR THE USE OF THIS WEBSITE AND THE INTERNET GENERALLY. THE MATERIALS ARE PROVIDED "AS IS," WITHOUT ANY EXPRESS OR IMPLIED WARRANTY OF ANY KIND, INCLUDING, WITHOUT LIMITATION, WARRANTIES OF MERCHANTABILITY, FITNESS FOR A PARTICULAR PURPOSE, NONINFRINGEMENT OF INTELLECTUAL PROPERTY, AND FREEDOM FROM ERRORS, VIRUSES, BUGS, OR OTHER HARMFUL COMPONENTS. We reserve the right to change, update, discontinue, restrict, or prevent access to this website or the Materials at any time without notice. We strongly advise our customers to check back often for possible changes.